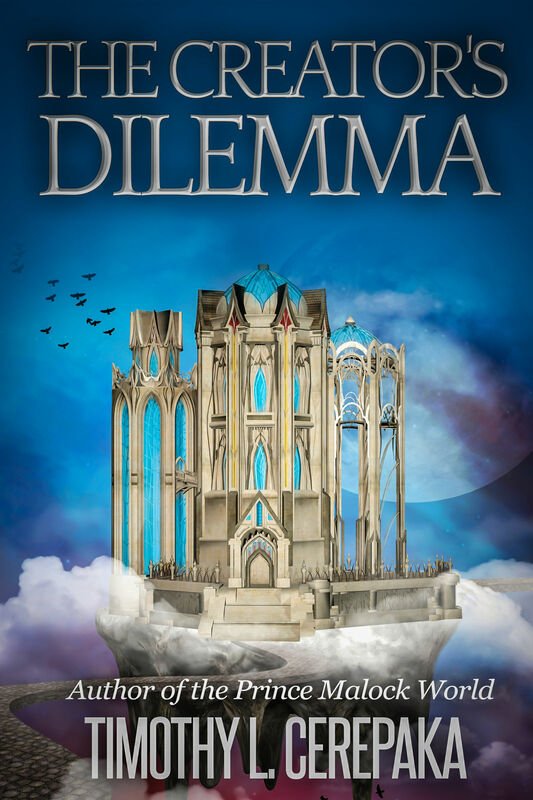 New short story, “The Creator’s Dilemma,” now available for $2.99 in ebook form! With the recent publication of The Coronation of Prince Malock (which you can read about here) and the Prince Malock World novella series not set for release until January or February of next year, you might think I have nothing to publish in December. Not true! In fact, I have a few things set for release this month, starting off with one of my short stories from the Fantastic Depths anthology, titled The Creator’s Dilemma. Pretty awesome cover, eh? It was designed by jimmygibbs. I picked out the cover art, but it was jimmy who made it awesome, so all credit goes to him. Over the next three weeks, I plan to get the other three Fantastic Depths short stories–The Most Beautiful Island in the World, Not Malicious. Just Unlucky, and The Gift of Valgink–up on all ebook retailers as well. Stay tuned for that. So if you’d like to be the first to know about the release of these short stories, you can subscribe to my newsletter here. As of this morning, I made a few minor changes to this blog. Firstly, I updated my Works page to include links to the Fantastic Depths anthology and a link to the short story I posted on this blog last month, The Most Beautiful Island in the World. Secondly, I added a new Contact page, complete with a contact form, for anyone who wants to send me a message privately. Been meaning to add one for a while and I finally got around to it earlier this morning. In recent days, I’ve discovered a couple of interesting websites that I’ve added to my “Interesting and Useful Links” page. The first is the website and blog of author Kristine Kathryn Rusch. Yesterday I spent a couple of hours reading the Business Rusch Publishing Articles which are an absolute goldmine for any writer looking to become a full-time career writer (it’s also the page I link to on my links page). In particular, I’ve found her articles on writing a will and planning an estate to be highly informative on a subject you don’t hear much about in books or websites on writing (although I haven’t read all of them yet). The second is a web tool called Readability-Score.com. Simply put, you copy and paste text into the website and it will tell you (using the Flesch-Kincaid Reading Ease score) how readable your writing is, among other things. I scored between 76 and 84 with my short stories from the upcoming Ambage anthology, which I guess is pretty good. If you want to know how easy your writing is to read (though not, of course, how good it actually is), then this website is for you. I am currently in the process of revising my short stories for the new Ambage anthology that is set to come out later this month. In particular, I’ve been revising the ending of one of my stories because I realized (thanks to some criticism I received from a fellow Ambager) that the original ending was predictable, flat, and unsatisfying. Not bad. Just . . . well, nothing worth writing home about, really. As I revise the ending, this process has made me realize just how important endings are to stories in general. I mean, I’ve always understood that endings are important, that you want to end on a note that (at the very least) is the logical result of the previous events in the story, but it never occurred to me how endings define stories far more than beginnings or middles do. Changing the ending of a story often changes what the story itself is about. Take, for example, a story about a boy and girl who fall in love. Depending on how it ends, the story could be a tale about how true love always wins in the end (boy and girl get married and live happily ever after) or it could be a tragedy in which true love rarely, if ever, wins (boy and girl get married, realized they don’t love each other after all, and then get a messy, bitter divorce). Of course, that is oversimplifying things quite a bit (there are more directions you could take the whole “boy meets girl” plot than the two I listed here), but I think the point still stands that we often don’t really know what a story is about until its over. Maybe that’s why we sometimes get upset at endings to the stories we read, especially longer ones. Throughout the story, we built up this idea about what the story was about, one maybe we’re especially fond of and could defend in a debate if we had to, so when we finally get to the ending, we are shocked to find out that our theories about the story are wrong or at least not entirely accurate. Of course, sometimes we dislike endings because they make no sense based on what the author had already written. For example, I didn’t really like the ending of Michael R. Hicks’s In Her Name: Empire. It simply made no sense to me. It felt like Hicks had already decided the ending, darn it, and he was going to use that ending even if the story would have been better with a different one. To me, that’s one of the perils of outlining*. You might become so fixated on your planned ending that you are afraid to change it even if the story is drastically different from the outline you originally wrote. We organic writers can get overly attached to our ideas, too, but I think we’re generally better than outliners at tossing out our preconceived notions if they no longer work with the story. And of course, we can’t forget the tried-but-failed Deus ex Machina, the god from the machine. More than one otherwise good story has been smote by this illogical deity over the years, especially stories by beginner writers. The Deus ex Machina can take on many guises, such as a character (whether new or old) coming out of nowhere to save the day or a character suddenly using a new power or ability with no build-up whatsoever to defeat the big bad. It’s probably the worst way to end any story, worse even than the whole “It was all only a dream” ending. I intend to keep all of this in mind while I revise the ending of that short story. This new ending will be a lot less predictable than the original, yet will hopefully make sense within the context of the story and leave readers with something to mull over, too. The only way to know for sure, of course, is to let other people read it and see what they think. What makes a good ending to you? What makes a bad ending? Are there any stories you can use as examples of these good (or bad) endings? Share your thoughts in the comments! *I have no idea if Michael R. Hicks is an outliner or not. The story felt like it had been outlined, but he could just as easily be a lousy organic writer. Either way, forced endings are still a problem outliners have to deal with more often than organic writers, I think. Recently I have been editing one of my short stories for an upcoming Ambage anthology*. And frankly, I haven’t been enjoying it that much. The story is seriously flawed in a number of areas and it has taken a good deal of thinking and fiddling on my part to sort them all out (and even then, I am under the distinct impression that I am missing something important). When I find myself working on stories like this one, it is intensely frustrating. I change a word, perhaps rephrase an awkward sentence, but I know that none of that helps in any but the most superficial of ways. I rewrite whole scenes, sometimes even the entire story, and it still doesn’t feel right. It’s frustrating enough that I just want to print it out and let my dog tear it to shreds. Of course, I know better than to do that. I’ve written frustrating stories before and I know that tossing them out is rarely necessary. All they need is time and patience on my part. As long as I stick to it, I know that sooner or later, I will reach that moment when everything makes sense, that moment when I finally understand just what this story is really about. I don’t have a name for such moments, mostly because it hasn’t been necessary to name them. Yet these moments of clarity are an important aspect of my own writing style. They’re a bit like a flash of lightning on a dark night. Though they last only a moment, it is long enough for me to know exactly what I need to do next. I am happy to say that I have reached such a moment yesterday morning while working on this short story. There are still problems to fix, of course, but it will be a lot easier and more fun now, I think, because I know what I need to do. This is what I love about writing. When a frustrating story finally works out like this, it makes the entire thing worth it. *I will be talking more about this anthology later, probably sometime next month. Stay tuned until then.